With marsh golf at its best, King and Prince is resort royalty on St. Simons Island in Ga.
ST. SIMONS ISLAND, Ga. - If you happen to get a ground-floor room at the King and Prince Beach and Golf Resort on St. Simons Island, bring your surfboard. The waves might just come crashing into your room. King and Prince resort is on St. Simons, a Georgia barrier island. The ocean's that close at the King and Prince, which occupies a prime piece of property on this barrier island off the southeast Georgia coast. 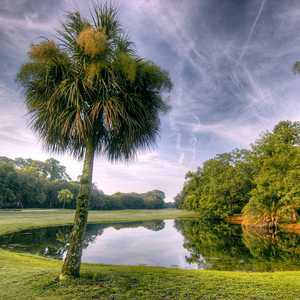 It's a pretty island, with historical sights like Fort Frederica, where Gen. James Oglethorpe built the state's first military outpost in 1736, and Christ Church, where John Wesley, the father of Methodism, first preached in colonial America. The King and Prince has some history of its own. It was built in 1935 as a private club, with big-band orchestras and ballroom dancing. Destroyed by fire not long after it opened, it was rebuilt in an astonishing 60 days, only to be damaged by yet another fire in the late '30s. Reopened yet again in 1941, it was closed to the public after German U-boats were spotted off the coast. The Navy used the site as a training facility for the duration of World War II. The King and Prince opened for a third time and 1947 and has survived as a seaside resort since, undergoing renovations in 1972, 1983 and 2003. This last revamp included a major reconstruction of the historic main building. The 70 guestrooms were converted into 57 larger units with expanded bathrooms. Some offer private balconies or patios overlooking the ocean or the grounds. The new oceanfront cabana rooms have parlors and private patios. The north entrance to the building, once the resort's main entrance, has been outfitted with a solarium with panoramic ocean views. There are now portraits of King George and Prince Charles Edward Stewart, as well as stained-glass windows. 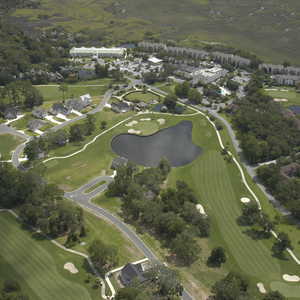 The resort offers all manner of recreation, including swimming and tennis, but the main attraction for golfers is the Hampton Club golf course. Of all the marsh courses I've played, from northern Florida through to Myrtle Beach and the Carolinas, the Hampton Club may be the best in terms of the views. That's because here, the views are from the marsh. Yes, you are literally in the marsh surrounding St. Simons Island, out there with the ospreys, bald eagles, woodpeckers and other wetland critters. How did they do that? Well, they carved four holes on the islands off the St. Simons mainland. You get to them via a series of elevated bridges. You are the marsh and the marsh is you. And how did they do that? Well, the course was built before all those pesky environmentalists started making waves about such things. It's a unique experience and one that will probably stay that way. "I'm pretty sure they wouldn't allow a development like this now," Brunswick resident Bud St. Pierre said. "Back then, they'd let it go." Situated on the relatively isolated northern reaches of the island, the Hampton Club pulses with the kind of raw beauty usually found on these islands' southeastern coasts. Ancient oaks frame the fairways. It's simply one terrific, camera-ready view after another. "The first seven or eight years, it was really something," said Rick Mattox, the general manager. "The development started back in the '90s. Now it's like we're part of the island." The back nine, built on the site of an 18th-century cotton plantation and including those four island holes, is the star half of the course. You'll be dealing with either the marsh or Butler Lake on seven of the holes. The front nine has its charms too. There's more sand - No. 5 has nine bunkers - and you'll have to carry Butler Lake twice on No. 9. "He really did a nice job of incorporating the lake," St. Pierre said of architect Joe Lee. The Hampton Club is a must-play if you're in the area. It's a challenging course elevated by its natural beauty. Plans call for a remodeling, but that will mostly involve new grasses. Nothing about the actual layout will change. "We're going to do exactly what Joe Lee did in 1989," Mattox said. "It's such a unique place, and obviously they provide us the money, which is nice."